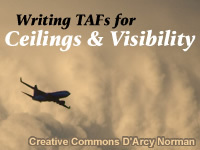 "Writing TAFs for Ceilings and Visibility" is the fifth unit in the Distance Learning Aviation Course 2 (DLAC2) series on producing TAFs that meet the needs of the aviation community. In addition to providing information about tools for diagnosing low ceilings and reduced in visibility and its related impacts, the module extends the Practically Perfect TAF (PPTAF) process to address an airport's operational thresholds. By understanding the thresholds at airports for which they produce TAFs, forecasters will be better able to produce a PPTAF. The unit also examines how to communicate effectively the logic and uncertainty using the aviation forecast discussion (AvnFD) and addresses maintaining an effective TAF weather watch and updating the TAF proactively. These courses are the best, I'm very glad to be able to take these trainings, and plan on reviewing again., all a person can do is learn something new everyday. * Determine potential impact to operations: General Aviation and Commercial Airline pilots * Identify the latest and most effective tools/products/data to limit uncertainty in forecasts for low ceilings and visibilities; o Make effective use of products (i.e., Aviation Forecast Discussions) to express uncertainty about these phenomena; * Identify model strengths and biases (include a discussion of the strengths and limitations of MOS and LAMP; and LAMP over MOS.) * Issue TAFs proactively for: o changing cloud heights o variable visibilities o any combination of these elements on an event-driven basis * Make decisions about potential weather changes and expressing ceiling, visibility, and precipitation appropriately in the TAF * Create a PPTAF that meets customer needs for airport (s) in case examples.